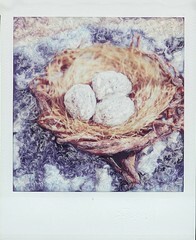 I LOVE doing SX 70 Polaroid manipulations BUT the film is no longer being produced, eek!!!!! Hubby bought me 20 packs on eBay last week and I just bought another 10 (no beads or fabric for me for some time, I have spent all my supply money for the month)I now have 300 exposures and after that, that's it, it's gone, finito! I love how these look on fabric, just wit till the gardens get going! This image is for something I am working on for artFiberfest, but that's all I am going to say. March 10, 2006 by carol strand.